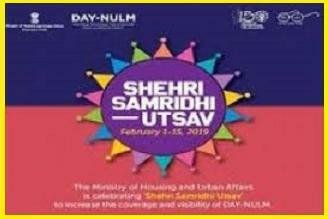 Union Ministry of Housing & Urban Affairs (MoHUA) has launched the Shehri Samridhi Utsav, an initiative that aims to strengthen the approach of Deendayal Antyodaya Mission – National Urban Livelihoods Mission (DAY-NULM) scheme to the most vulnerable people. The Shehri Samridhi Utsav will facilitate access of Self-Help Group (SHG) members to the other government schemes. The Shehri Samriddhi Utsav began with a series of rallies led by women’s’ SHGs across the country. These rallies spread awareness about DAY-NULM in urban poor communities. Through Shehri Samridhi Utsav, the SHG members across cities are being linked to government schemes such as Swachchh Bharat Mission (Urban), Pradhan Mantri Awas Yojana (Urban), Ujjwala Yojana, Pradhan Mantri Jan Dhan Yojana, Pradhan Mantri Suraksha Bima Yojana, Pradhan Mantri Jeevan Jyoti Yojana, and National Nutrition Mission.